Have you ever heard of the term ‘Chameleon’? Probably you did. This term is referred to the unique species of reptiles that can change their skin color according to the surroundings. Sometimes we, the people, also fantasize that it would be wonderful if we could change our skin according to our own wish. We may have to wait for an indefinite time for this to happen but now, at least we could get our cars or bikes to shed their skins to stunning colors or beautiful design patterns easily; thanks to the new technology called Water Transfer Printing. This technology was showcased by ‘Autofina’ – a company based in Chikhali, Pune at the recently held Auto Engineering Show 2014 in Pune. Different names for Water transfer printing is ‘Hydro-graphics printing’, ‘Immersion printing’ and ‘cubic printing’. The company claims that this is one of its kind ‘multi-colour 3D printing’ technology that you can apply to any shape or surface of the product. According to them, it is a ‘surface decoration technology’. 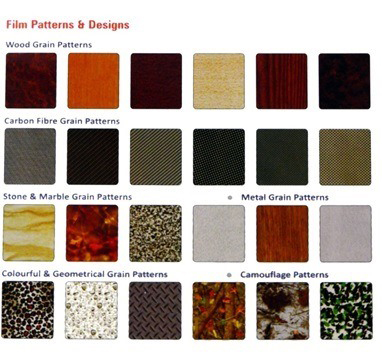 Furthermore, this technology uses specialized ‘water-soluble’ printed films which are available in natural designs such as Woodgrain, Stone and Marble grain, Carbon Fibre grain besides colorful patterns and geometrical designs to decorate any kind of product. This includes car interior accessories such as plastic trims and panels, door handles, switches, electronics, architecture, and even household items. You can apply the Water transfer printing process to different materials. These include metal, plastic, glass, hardwoods and various other materials. It is able to coat on complex three-dimensional shapes with very high quality. So, it creates a new colorful decorative appearance on the printed product which enhances its value. You can also customize the film with any digital image. 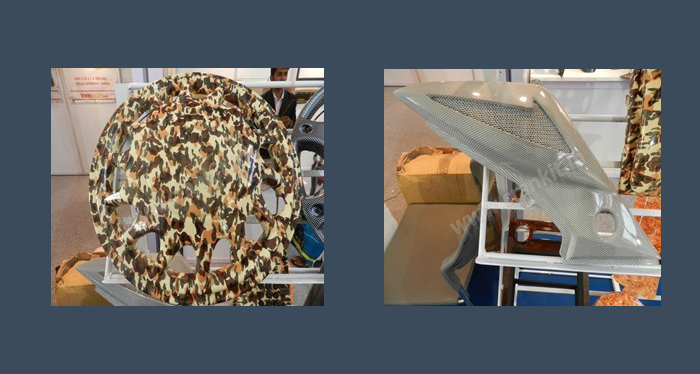 The company is currently supplying items like pfeda linings, door handles and dashboard plastic parts as OEM supply to many auto manufacturers such as Force Motors, Tata Motors, Bajaj and DC Design. The cost of printing, according to their representatives at the exhibition is approximately Rs. 200/- to 250/- per Square-Feet. 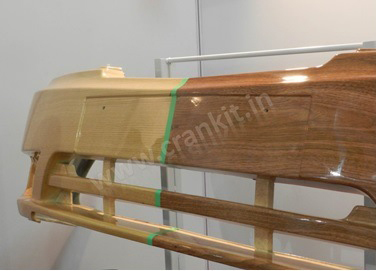 The manufacturer estimates the typical cost of printing a car bumper to be Rs.2000 to 2500 approx. This is not unreasonable considering the quality and unique appearance of the same. Hence, if these products become available in the after-market, you could transform your car, bike or any other personal item. The designer films are available in the following patterns & designs. Further information about the water transfer printing technology or the Autofina company can be viewed at www.autofina.com.